Via the lens of expert British colourist Royston Leonard and the curatorial skills of Messy Nessy Chic, we’re able to be privileged witnesses to a rather dark episode in the fraught history of European settlers with indigenous peoples and those they’ve occupied and colonised. 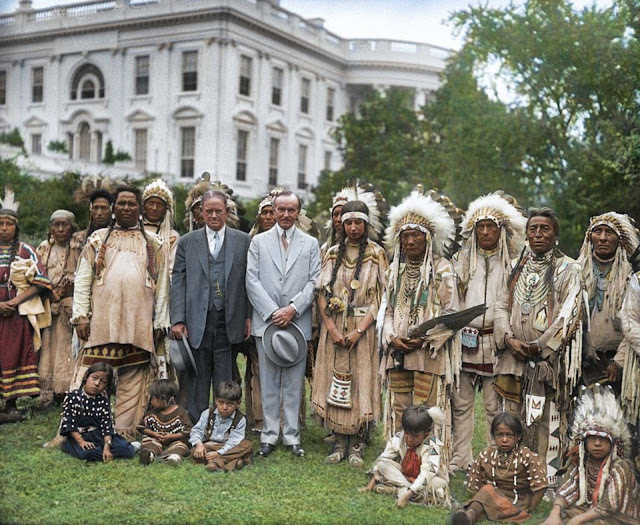 Though not perhaps not the worst slight in the scheme of things, Leonard’s print (more at the links above) show a delegation of Native Americans invited to the White House to petition President Calvin Coolidge in the early 1920s for the passage of a congressional act that would bestow US citizenship to the majority, up to three hundred thousand, who were systematically disenfranchised and denied participation in civic affairs and the democratic process. Though the Fourteen Amendment to the US constitution gave (grudgingly) citizenship to all people born within US territory, regardless if they were descended from enslaved ancestors—with no state making or enforcing laws which shall abridge the privileges or immunities appertaining thereto. Native Americans were not covered by the amendment, however, many argued because, Article One, which deals with the apportionment of representatives in the federal legislature that each state gets, says that “Indians—not taxed” were not counted as constituents because they didn’t pay property tax on sovereign tribal lands (compare to the Three-Fifths compromise that counted only three out of every five enslaved individuals for setting a state’s population) and because they kept their tribal affiliations and did not integrate well with non-Native American society. Before the act’s passage in 1924, sponsored by New York Congressman Homer P Snyder, Native Americans could apply to become naturalised citizens, like any immigrant, and often vouchsafed the process through marriage or military service—and it was in part due to the role that the enlistment of many Native Americans had for World War I that the act was passed.